This dog is extremely obedient and dependable. It also has a high intelligence and is devoted to its owner and family. This breed is always willing to please those whom it lives with. Because of these traits, this dog excels as an excellent herder. If there are other pets in the home, the Canaan dog will get along with them once it gets to know them. When it is introduced with strange human beings that it does not recognize, however, it tends to be aloof and will become very territorial and protective of its family. It guards by nature, which is what makes it an exquisite guard dog. Some Canaan's tend to bark a lot. It is extremely important for this breed to be exercised and/or given tasks on a daily basis. It does not thrive if it is just sitting around. It can actually become quite destructive. Physical stimulation and mental stimulation can be achieved through herding exercises, long runs, and/or strenuous games and difficult training sessions. As a house dog, it does well, assuming it gets adequate amounts of exercise. Health concerns of this breed are fairly mild. There are really no trending minor or major concerns when dealing with this breed. There is also no trending condition that tends to be occasionally seen. However, with most dogs, it can develop any type of issue, especially with age, which is why it is so important to ensure your Canaan is taken to the vet regularly for tests to be run to ensure it stays healthy. The most suggested test for any dog breed is the hip test, however, it does not hurt to get other tests as well. Cataract tests should be administered as well as joint tests. If you do keep you Canaan healthy, it can live anywhere from to 12 years of age to 13 years of age. 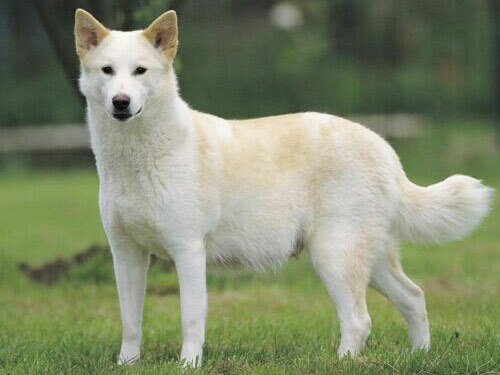 The Canaan dog breed has evolved and survived despite the hardships that their breed has faced. When the Israelites were run off of their homeland, Kelev Kanani, most of the Israeli dogs were left to survive on their own. The Romans chased out the Israelites over 2000 years ago and that is how long this breed has managed to hang on. The Bedouins kidnapped male puppies and used them to guard their herds of animals. In the 1930s, traditional European breeds were unable to complete tasks due to the harsh climates. Of all the people that may have helped the Canaan along the way, one woman, Dr. Rudolphina Menzel is more responsible for their survival than anyone else. She led a search for a better suited dog to withstand harsh climates and perform the tasks needed. Some Canaan’s were captured and they proved their ability to everybody serving as sentry dogs, messengers, mine detectors, and guard dogs. They even served as seeing eye dog for blinded World War veterans. The breed was first introduced to America in 1965 and the AKC admitted this breed in 1997 under the Herding Group.